Before we begin this post, I have to make a confession: prior to writing couponing blogs and becoming a stay-at-home mom (now a homeschooling mom as well), I was a math teacher. A middle school math teacher. Yes. I know... quite terrifying. And you know what? I loved it. Teaching math is my passion. It's so much a part of me, that when I began taking advantage of couponing deals, all I could think about was how valuable the experience would've been for my middle school students during my teaching days. You see, couponing hacks are all rooted in math. If you want to learn more about how to coupon, check out my FREE ebook that offers couponing basics for beginners. This couponing guide teaches readers how to invest 20 minutes a week and save hundreds of dollars a year on groceries. Below are six reasons it's worth the effort for math teachers to join the couponing community. Ratios, proportions, and unit price may all be written as fractions. In order to solve these kinds of problems (during a test and in the real world), we need to have a basic understanding of the properties of fractions. This can be challenging for many students, because understanding fractions requires us to generate a mental model of fractions operations. If fractions is a pain point for the students in your life, make fractions operations more tangible through couponing. When working with money, two places after the decimal represent cents (a fraction of a dollar). If an item costs$1.99, and the coupon takes off $1, it doesn’t make sense that the item would now cost $1.98. Lining up the decimal places when you add and subtract makes a lot more sense when you do it with money! Couponing requires understanding of unit price. When you are trying to find unit price, items price labels may show different measurements. For instance, one bottle of soda gives volume in ounces but another shows volume in liters. In this case, couponers (and students) need to tap into their math skills to convert between the two units. A different example of unit conversions involves tripling the serving size of a recipe. Instead of purchasing 21-Tbsp of a grocery item, it may be necessary to convert this amount into cups. A coupon or sale may provide for a certain percentage off the price of a certain item. Couponing teaching learners to calculate discounts in this way: students learn how to determine the resulting price after taking 25% off a certain amount. 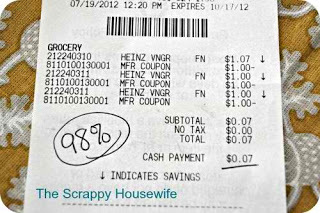 Why use percentages worksheets, when couponing gives real world experiences? Would you learn more from percentages word problems or saving cold hard cash in real life? Calculating discounts and sales tax are opportunities to solve multi-step mixed operations with whole numbers and decimal numbers. As couponers, we're always after the best deal. If six rolls of toilet paper cost$3, and eight rolls of toilet paper cost$3.50, which is the better deal? You have to brake it down into how much one roll costs with each deal. This involves using proportions to find the rate in price per roll, which is the unit price. An app called Flipp scans grocery stores near you. Searching the app shows the cost of grapes at different stores, for example. This feature of the app provides an opportunity to defend decisions about which store has the best deal. This approach is especially useful for comparing decimals. There are many ways that coupons can help children master math standards; these are six important approaches to improving math skill with real world experiences. If you have other ideas, or you just want to share how you were able to use these tips, I would love to hear about them. Tiffany Thomas is a former math teacher and SAHM who loves finding good deals! She and her husband launched The Crazy Shopping Cart. They enjoy spending time with family, geeking out over sci-fi, and saving money.